Pearl, the white Border Leicester/Shetland cross, had her twins today. 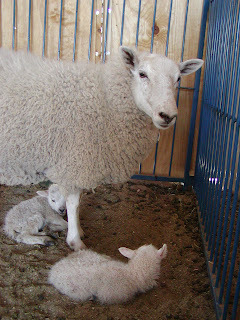 She was a first time mom, so I expected problems, but not two lambs that hung in her just long enough that I had to swing them around by their hind legs and then poke my finger down their throats as far as I could to get them breathing. If I had not been there, they would have been dead. Pearl was just standing there looking at the first one. I had to pull the second. An hour and a half later, both are standing and nursing on their own. Have I mentioned that I now have 9 more to go and only 2 of them are NOT first time moms? I have not named these two, so any suggestions? The last two rams that were born were named by customers this morning - Hershey and Mars. I have not used those yet, have I? Got to go update my Baby spreadsheet and check names.